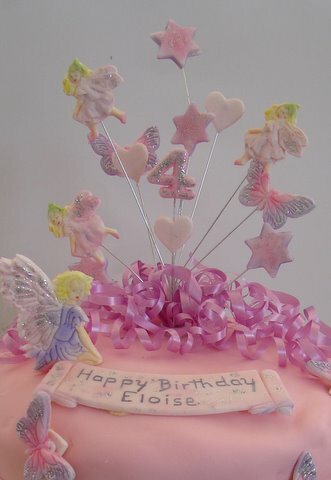 Some of you may remember a post a week ago when I said I was going to try not to get carried away about Eloise's Birthday party? Well, I really didn't try that hard. I got totally carried away and have loved every minute. The party is tomorrow and I've been busy all day getting ready for it. I really need to just sit down and relax now but couldn't wait to show you a sneak preview. 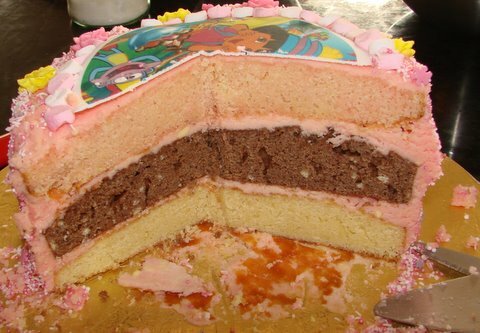 First of all, Eloise's birthday cake. I am so pleased with it and Eloise loves it too. She said "Oh Mummy, it's just like the one I wanted!" You can't get better praise than that. The wire cake topper and all the butterflies, the plaque and the ribbon came from a really lovely Trade Me seller called Margaret. (Hamish329). She has just started selling on Trade Me and I can't recommend her highly enough. The set I described above only cost me NZ$22 and I can't say enough about how wonderful it is. The recipe is in the latest Donna Hay children's annual. 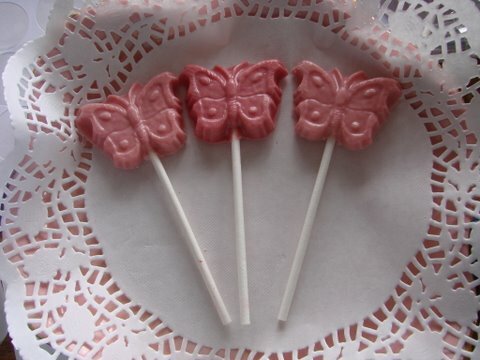 I've made some pink chocolate butterfly lollipops. The mold came from another Trade Me seller (Kirinlockie). If you want to colour chocolate, get some food colouring paste as the liquid just ruins the chocolate. The paste is awesome. I had never used it before this week and now I am totally hooked. It's really reasonable considering how far a little bit goes. 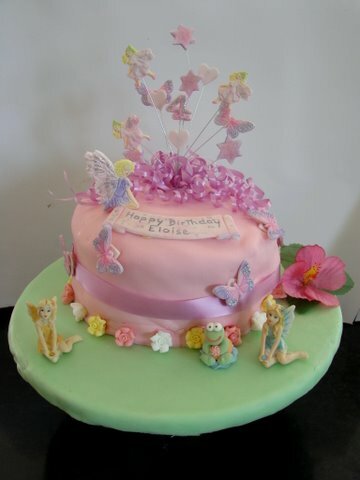 I got mine from the cake decorating shop on Hurstmere Road in Takapuna (a couple of shops down from Cotton On Kids). And I finally, here are the cutest little personalised stickers that I bought from another Trade Me seller (charliehorse_nz) And yes I know, I went a little mad with these bits and pieces, but everything else I used for the party came for what I had at home so I think I can justify it! The little stickers are just gorgeous and are a great and totally inexpensive way to add gorgeous little personalised details. Here they are on little lollipops. I took the plastic wrapper that they came in off them and used glad wrap secured with a little tape. The old wrappers stuck out at the side and just didn't look pretty. 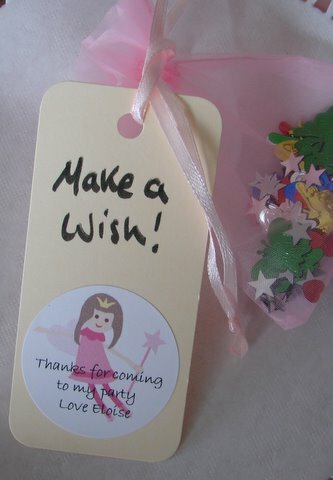 And here the stickers are on the little bags of fairy dust I made up for the loot bags. So cute but I am going to have to remember to warn the Mum's that this glitter fest is in the loot bags before they go home otherwise I am NOT going to be popular. 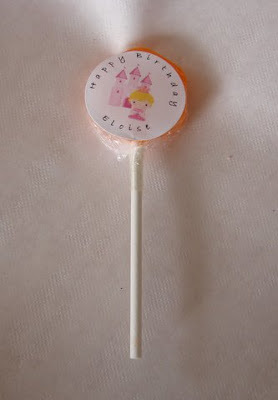 I can just imagine lolly-fuelled kids let loose with fairy dust inside. Hmm. Not the best idea maybe but fairy parties NEED fairy dust. I am soooo excited about tomorrow. I'll post pics when I've recovered. That cake is amazing Sarah!! Have a great day tomorrow. Looks fantastic! All looks so gorgeous! Have a brilliant day tomorrow. Oh wow the cake looks amazing! And all the little bits to make the day so special, what a lucky little princess, have a fun time!